Sixty-five years after the atomic bomb was dropped on Hiroshima the threat of nuclear war is as serious as ever. 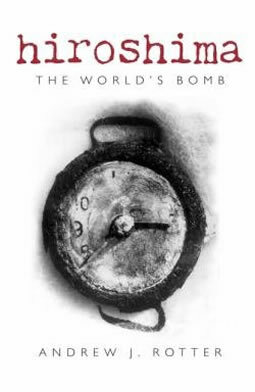 Peter Arkell reviews a new book about the development of the first bomb. Andrew J. Rotter in his new book Hiroshima: The World’s Bomb, writes a detailed, comprehensive and all-sided story of the bomb. He describes the discoveries and the experiments in physics in the period leading up to the war and the gradual realisation that the unbelievable quantities of energy released when splitting the atom might be harnessed into a bomb. He puts the new discoveries into their political and military context and describes the creation of communities of scientists not just in America, but in Germany, France and the Soviet Union to develop the science and its practical applications. He recounts the harnessing of their efforts by the wartime states, the political decisions that led to the bombings, the impact of the bomb on the war and the subsequent politics, the doomed attempts to control the spread of the nuclear weapons after the war, the nuclear arms race and the situation today, 65 years later. In 1943, a large international team of physicists and mathematicians were brought together in 1943 at Los Alamos in New Mexico to manufacture, under the careful military oversight of a US colonel, the first atomic bombs. Then at 8.15am on 6 August 1945, three months after the surrender of Nazi Germany in Europe, a single American B29 bomber dropped a single bomb from a clear blue sky over the centre of Hiroshima City. The bomb, nicknamed “Little Boy”, exploded 43 seconds later at an altitude of about 2,000 feet destroying the whole town. Nobody knows exactly how many were killed, but a year later the Hiroshima City Office estimated that 140,000 had died up to that point, most of them civilians. Three days later “Fat Man”, a different type of atom bomb, was dropped on Nagasaki, killing about 70,000, nearly all of them civilians. Rotter calls it the world’s bomb. “Americans alone”, he writes, “did not decide to build the bomb and neither did they alone actually build it. The science that enabled the bomb was conducted internationally; Hungarian, British and German scientists and mathematicians, for example, were among the bomb’s most important theoretical pioneers.” It was, in other words, a project by the scientists of the world to unlock and reveal a part of nature that happened to have within it the possibility of use or misuse by the powers in the world. This is an absorbing read. And the story is made doubly exciting by the ability of the author to bring out the pressures and responsibilities put onto the scientists, the politicians and the military by the enormity of the bomb’s power to change the military balance, to wipe out entire populations and change the future of the world. Scientists saw themselves as part of a scientific republic. “That discoveries concerning the atom would be shared, through journal articles, at conferences, in coffee houses and taverns and labs, was a matter of faith among the world’s physicists before the Second World War. One could not patent or nationalise the atom”. Such sentiments, passionately held by the scientists, counted for little in the atmosphere of all-out war between nation states. Nonetheless, this debate of conscience amongst the physicists that rumbled on through the war and afterwards is well brought out in the book through the descriptions of the different outlooks and thoughts of the individual scientists. The book takes up the questions that are always asked: Was it necessary, from a military point of view, to drop the bomb? Was Japan about to surrender anyway, looking for a way of doing this with honour? Was the bomb dropped to intimidate the Soviet Union? Do scientists have a duty to serve their national government if asked? Can they refuse? What about their other loyalties such as to the scientific republic? The book sidesteps these controversies but the author does consider the broader questions of why the bomb was used. He highlights the racist attitudes towards the Japanese. Unsurprisingly it was the military who came up with the most extreme and shocking statements: “If it is necessary to win the war, we shall leave no man, woman or child alive in Japan and shall erase that country from the map”, said Admiral Jonas H. Ingram. “When you see the little stinking rats with buck teeth and bowlegs dead alongside an American, you wonder why we have to fight them and who started this war,” is attributed to Lieutenant General Holland M. (“Howling Mad”) Smith. “The men who made the decision to drop atom bombs and decided where to drop them shared the sharply racialised sentiments of their officers and fighting men,” writes Rotter. This, concludes the author, helped to justify the dropping of the bombs on the Japanese cities but does not explain it. Nor does the argument that the bombs were dropped primarily as a means of compelling the Soviet Union to behave more cooperatively in the negotiations over the future of the world, especially the future of central and Eastern Europe, though this too was an important factor. What the book does not or cannot bring out is a credible strategy to take the world away from the dangerous present where at least eight rival war-like nation states are armed from head to foot with state-of the art thermo-dynamic nuclear super-bombs (measured in millions of tons of TNT equivalent) to a future without the bomb at all. The book may throw up the question by implication but it makes no attempt to glimpse beyond the present status quo to answer it. The bomb remains, of course, a constant threat to humanity in general, under the insane dynamic of world capitalism and the production of commodities and goods for profit within competing nation states. The atom bomb is not a single issue which can be considered outside or separate from politics in general. To solve the problem within the status quo is plainly impossible. No single capitalist government is going to renounce the bomb, and to imagine that it is possible for the nuclear powers led by the US, Russia, China, India, Britain and France to ditch it through the implementation of a treaty is to live in dreamland. The Campaign for Nuclear Disarmament (CND), supported of course by the Communist Party, do peddle this view that one can rid the world of nuclear weapons through mass protest action without challenging the power of the state to wage war on behalf of capitalism. The struggle to get rid of the bomb is absolutely bound up with the effort to release humanity from the grip of the capitalist corporations and the states that serve their interests. Many commentators and experts held out visions of a future without the bomb after the collapse of the Soviet Union in 1990, imagining naively that a united capitalist world could act in concert. In reality, the threat to humanity from the bomb is greater now. That, at least, is the view of the editors of the Bulletin of the Atomic Sciences, who gauge the nuclear threat by means of a “Doomsday Clock”, where midnight signifies nuclear war. “The editors of the Bulletin”, Rotter writes, “are not optimistic about the fate of the earth. In January 2007 the minute hand of the Doomsday Clock moved ahead from seven to five minutes before midnight.” The new dangers included “a recent North Korean nuclear test, Iran’s interest in nuclear power, signs that the Bush administration would consider the use of nuclear strikes on unfriendly nations and the ongoing insecurity caused by the presence of 26,000 nuclear weapons in the US and Russia alone”. The bulletin also acknowledged that climate change represented a serious threat to the welfare of the earth. “The growing interest in nuclear power, in part as a remedy for global warming, risks spreading nuclear material across the globe.” And the scientists pointed out that spent fuel from peaceful nuclear reactors can be processed into weapons-grade plutonium, only 1-3 kilograms of which are needed to make a bomb. “The clock is ticking”, the bulletin concluded.